IBA is trustee for the Indigenous Economic Development Trust (IEDT). 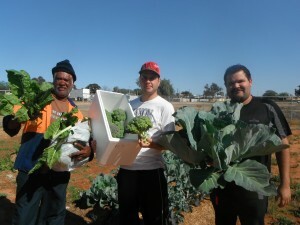 Staff at Wilcannia: [L:R] George Bugmy, Kev Jenkins, Robert Clayton. Image courtesy of Steve Ross. The IEDT was established in 2007 to assist the Australian Government in managing assets required for the delivery of Indigenous programs focused on remote employment, youth, health and education, such as the Remote Jobs and Communities Program (RJCP). Assets (including land, non‑land and funding) are settled into the IEDT on a conditional transfer that enables a clear understanding of how the assets will be used for current and future Indigenous program delivery. The IEDT manages the assets and gives priority to Indigenous individuals or organisations when leasing them. The goals of the IEDT are to be commercially sustainable; deliver financial returns to beneficiaries (Indigenous Australians) each financial year; achieve direct Indigenous outcomes through leasing (property, vehicles, plant and equipment); achieve direct Indigenous outcomes through distributions; and increase equity by 10 per cent over a rolling three‑year period. As at 30 June 2016, the IEDT had $12.5 million in equity. The construction of the Wilcannia Community Shed was project-managed by the IEDT. The project included locating suitable land; obtaining local council approval; identifying shed design and selecting shed contractors; engaging local Indigenous tradespeople for concrete slab construction, internal works, electrical work, plumbing and painting; and using local staff in fence construction and landscaping works. The facility includes a workshop area with a training room, two offices, kitchen, shower, toilets and reception area. Community Development Employment Projects took up occupation on 14 June 2011 and has operated in the premises since that time (now as RJCP). The entire project included 26 Indigenous construction staff members, mostly Wilcannia locals. This represented a total of 69 per cent Inigenous employment in the project. Additional trust beneficiary funds were used to design, build and fence the land surrounding the centre for horticulture beds and irrigation, including importation of appropriate soil, water tanks and associated equipment to produce and process fresh vegetables.